After threatening to run for years, real estate mogul and reality television star Donald Trump on Tuesday announced his candidacy for the 2016 GOP presidential nomination. For real, this time. For years, Donald Trump has been one of the most famous non-candidates for the presidency, always pretending to run just long enough to drum up sufficient press to ensure interest in his next business or reality television venture. So, when Trump started teasing about a 2016 run, lots of people who remembered 1988, 2000, 2004, 2008, and 2012 were skeptical. Even when Trump launched an exploratory committee, there was doubt. Now that even Republicans can’t stand him anymore, Trump is running. In the early phase of the 2012 campaign, Trump was leading in the GOP primary polls. Now, about four years later, most Republicans don’t want him. A Bloomberg/Des Moines Register poll of the Iowa caucuses showed that 68 percent of caucus-goers had an unfavorable view of Trump, compared to just 26 percent who still liked the guy. A similar poll in New Hampshire showed that 69 percent had an unfavorable view of Trump, while just 19 percent had a favorable view of him. Whether Trump really wants to be president or not is anybody’s guess, but he joins an increasingly crowded field of long-shot candidates who have only the slimmest chances of getting the nomination, let along winning the general election. But, win or lose, Trump give a big boost to the entertainment factor of the GOP primaries, as long as he’s in the race. Maybe that’s it. Maybe Trump’s campaign will be spun off into another reality television show, and his launch speech was the preview. Here’s what you need to know about Donald Trump, now that he’s finally running. Trump’s biggest contribution to the 2016 race may be as a symbol of who our economy really works for. Aside from entertainment value, Trump’s most important contribution to the 2016 presidential race may not be as a candidate, but as a stand-in for the people our economy is rigged to work for. Author Lee Siegel, who defaulted on his student loans, noted a double standard: many famous millionaires and billionaires, including Trump, have filed for bankruptcy to rid themselves of debt. Yet, it’s only a question of morality when it comes to students. In fact, Trump’s filed for corporate bankruptcy four times, allowing him to get rid of debts when deals went south. Most debts are dischargeable though bankruptcy, but not student debt. Robert Reich pointed out that the wealthiest Americans, like Trump, can avoid the consequences of bad business bets and losses, because the law protects them. Trump has even said as much himself. When Atlantic City’s Trump Plaza closed and Taj Mahal filed for bankruptcy last year, some 1,000 employees lost their jobs, while Trump took to Twitter to claim that he had “nothing to do with Atlantic City,” and patting himself on the back for “great timing” in getting out of the investment. He could do that, because limited liability and bankruptcy laws protect wealthy people like Trump, leaving the real economic risk to be borne by the rest of us. House Republicans fought to give Trump and 5,400 multimillionaires a $270 billion tax break by repealing the estate tax. Trump’s not that great a businessman. Trump says his business experience would play well in Washington, because government needs people who “know how to make a deal.” He touts himself as the “most successful” candidate in the race. Obviously, Trump defines “success” as wealth. What do Trump’s business history and dealings tell us about him? He seems to be in the business of declaring bankruptcy. First, we have to address the notion that wealth equals “success,” and someone who’s “successful” in business would do a great job of leading the country. 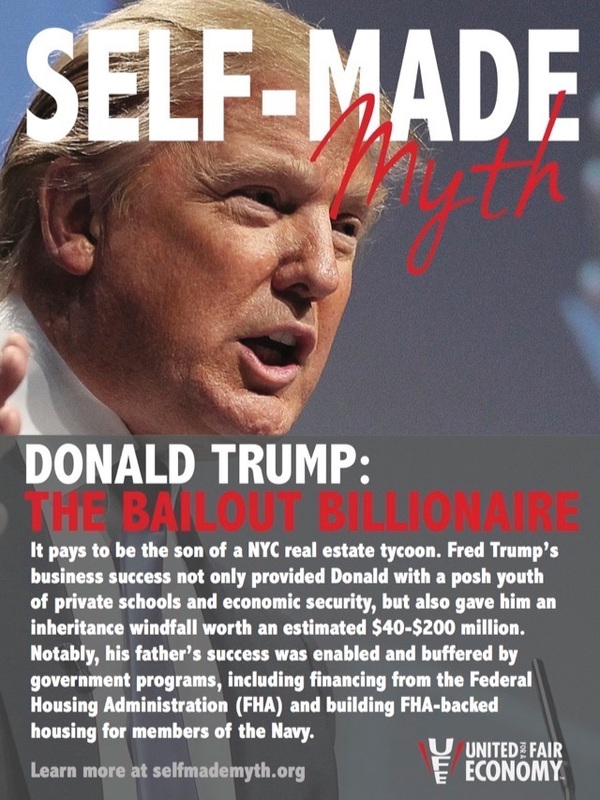 Our embrace of the “self-made” myth makes it easy to admire someone like Trump. It also makes it easy to forget that Trump inherited much of his “success.” As the son of real estate tycoon Fred Trump, Donald Trump’s inheritance was estimated at $40 million to $200 million. (The elder Trump’s fortune, by the way, was enabled by financing from government agencies like the Federal Housing Administration. Trump took over his father’s business in 1974, and spent the next 15 years expanding into buying and branding buildings, hotels, casinos, and golf courses. By the 1990s The Trump Organization was up to $8 billion in debt, plus nearly $1 billion guaranteed by Trump himself. A deal with his creditors allowed Trump to defer nearly $1 billion in debt and take out mortgages on most of his properties. In exchange, Trump had to give up his airline, his yacht, his jet, a couple of properties, and somehow get by on the $450,000 monthly allowance creditors allowed him. By 1995, Trump had gotten his house somewhat back in order, his jet back, and his salary. Somehow, by 2004 Trump was back in trouble again. Trump Hotels & Casino Resorts declared Chapter 11 bankruptcy. Then in 2009 Trump Entertainment entered bankruptcy. All in all, Trump declared bankruptcy in 1991, 1992, 2004, and 2009. So, is he running on how well he’s run his business, or how many times he’s run his businesses into the ground, and in his own words “used the laws of the country to my advantage,” to get fresh start after fresh start? Trump’s Twitter account alone should disqualify him for public office. No. Really. The only reason Trump is still on Twitter is because he’s Trump, and there’s nobody big enough to tell him instantly communicating his thoughts to the world probably isn’t the best thing for him. And Trump’s ego keeps him from considering that the world doesn’t need his opinion nearly as much as he thinks it does. Twelve-year-old boys behave better on Twitter than Trump. Every conspiracy theory, every whacked-out, half-backed notion that metastasized in the mind of Donald Trump, is there in his Twitter feed, just waiting for his next interviewer or debate moderator to find them. Here are some of the worst. Here’s Trump turning the train derailment outside of Philadelphia into a crass political rant. Here’s Trump attacking “Our great African American President,” over the unrest in Baltimore following Freddie Gray’s death at the hands of police officers. Here’s Trump on vaccinations and autism. Here’s Trump on global warming and winter’s cold. Here’s Trump on President Obama’s birth certificate. Here’s Trump losing it after President Obama’s re-election. We can’t let this happen. We should march on Washington and stop this travesty. Our nation is totally divided! Here’s “The Donald” being outraged the Ringling Brothers is phasing out elephants. Trump even stuck his name on a for-profit “university” that ripped off students. When he wasn’t stiffing his creditors, and letting the people who work in his buildings absorb the real losses, Trump tried out another business model: ripping off people who belief that because he’s rich and successful, Trump could teach them how to be as successful as him. Trump University was born, for up to $35,000, students had the opportunity to learn how Donald Trump became a real estate mogul, and made his fortune, at a university bearing his name, from Trump’s handpicked instructors, and maybe getting wisdom directly from “The Donald” himself. Or, rather, Trump came up with another way to make money off of his name, by charging students to attend a three-day seminar masquerading as a school, taught by instructors who didn’t know anything about real estate, using a curriculum developed by a third-party company, and where the closest they got to the man himself was a life-sized cutout. Trump netted about $5 million from all of this. New York’s Attorney General, Eric Schneiderman filed a $40 million civil lawsuit on behalf of 5,000 people, charging Trump and his “university” with “persistent fraudulent, illegal and deceptive conduct.” The suit accused Trump of operating an unlicensed educational institution. Schneiderman claimed Trump U. was a “bait and switch” operation, that lured students in with free sessions, then offered packages ranging from $10,000 to $35,000, and then urged them to increase their credit limits to pay for the packages. For his part, Trump tried to link President Obama to the lawsuit. On “Fox & Friends,” Trump speculated that President Obama was using the lawsuit to target him. Of course, the real secret to Donald Trump’s success doesn’t take three days to convey, but it can’t really be taught: Be born into a wealthy family. Trump takes “birtherism” to new depths. Trump is a long-time birther, going back to 2011 when he teamed up with Fox News to promote various birther conspiracies, by claiming that President Obama had not released a valid birth certificate. Later, when the White House finally produced the president’s long-form birth certificate, Trump suggested it was forged. Trump even went birther on Sen. Ted Cruz (R-Texas). Then Hawaii state Health Director died in an airplane crash, and Trump joined other birthers and cooked up a truly insane conspiracy theory.